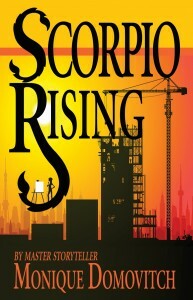 As a part of promotional extravaganza sponsored by Novel Publicity book tours I am happy to introduce Scorpio Rising by Monique Domovitch to my readers. Scorpio Rising is the first part of The Scorpio Series followed by The Sting Of Scorpio. Some people have ambitions so great, that to achieve them, they must put aside all else. Alexander Yvanov is such a man. Born in Brooklyn from an embittered mother, he climbs his way to a better life in New York. Thousands of miles away, beautiful Brigitte Dartois, also has big dreams and raging ambitions. This is the story of two people whose single-minded obsessions are put to the test when they meet. Will they choose love or success? Monique Domovitch takes us on a breathtaking journey of twists and turns, from New York to Paris, in this, her stunning first novel, Scorpio Rising. 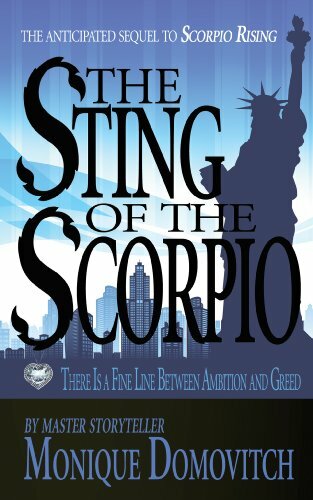 If you enjoyed Scorpio Rising, you will love its sequel, The Sting of the Scorpio. Alexander Ivanov returns to New York with his beautiful bride, Brigitte Dartois, and begins his dizzying climb to the pinnacles of success. To attain his goals, Alex plots his way, betraying friends and creating enemies. When Power Properties becomes the victim of a hostile takeover attempt, Alex is left to wonder who among those closest to him has turned on him while he struggles to keep his beloved company. Brigitte was filled with anger, betrayed by her mother’s indifference. One night, when Brigitte was alone in the house with her stepfather, she awakened to a pair of rough hands moving over her body. “This will be our little secret,” Lucien told her when she opened her eyes. “If you even think of telling anyone, I’ll kill you,” he said. Then he raped her. Her mother worked the evening shift as a barmaid at a club down the street, and for the next three years, it became a nightly ritual for Lucien to stop in for une petite caresse, as he called it. Every night he gave her the same warning. “You tell anyone and you’re dead.” Sometimes he went into gruesome details of what he would do to her if she ever told. Brigitte believed him. So, she kept her mouth shut. Once, she was the top student in her class. Her grades began to slide until she was close to failing. She slept at her friends’ flats whenever she could. At home, she was silent and withdrawn. Her mother barely noticed. In shock, Brigitte realized her mother was speaking to her. She had lost! Lucien had won! She dressed as quickly as she could, threw a few of her things into a pillowcase, and slipped silently down the hall to the closet where her mother kept her purse. Sorry, but I’ll need this more than you will. She took all the cash she found. Then she left. Now time for the giveaway, you can enter to win 2 Kindle Fires, Amazon gift cards up to $100 in amount, 5 autographed copies of the book, AND 5 autographed copies of its recently released sequel, The Sting of The Scorpio. So what do you have to do to enter win the awesome prizes!! Follow this LINK and fill up the form! Thank you for the cool, easy to read post! Thank you for giving me and my novel the space and time. Love you!!! Love your blog!! !